Is there a bright coloured tape, preferably orange, that I can apply to a portion of the fly so it is more visible in snow during daylight and also has some reflective properties so it is visible at night? Also please consider that the tape or markers need to accommodate the stretch in the fly. Does any such product exist? 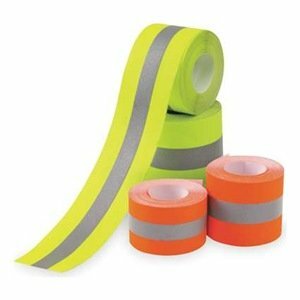 I recommend reflective lines for at night, and standard flagging tape for during the day. Both are lightweight and the triptease line really jumps out at night when hit with a light. As Russell mentions, flagging tape can work well in this situation. I carry a roll in my first aid/survival kit, as it's also useful for marking your path if you're lost, among other uses. A more permanent and reflective alternative would be to get some type of reflective fabric and attach it to your fly. You could potentially sew it on, if you're not too concerned about water ingress, or you could just sort of drape it over the fly. Not the answer you're looking for? Browse other questions tagged tents gear-care improvised-gear winter-camping or ask your own question.